For anyone who hops around the wine world, you start to notice a common thread which is that the highest elevation vineyards produce some of the most interesting wines. It’s not a fact that they produce the “best” wines as that is largely dependent on taste (Côte de Nuits in Burgundy is below 300m and produces some very highly regarded bottles for instance), but to quote Jaume Roca of the very excellent Ficaria Vins in the high altitude village of La Figuera, “they’re just different”. 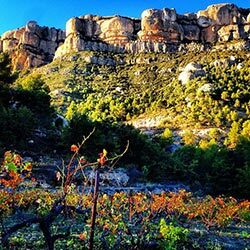 This is largely true as seen with Priorat where exciting vineyards are found at 700m like Les Manyes from Terroir al Límit, Les Garnatxes de Scala Dei, Els Escuçons from Mas Martinet, and others. In Etna in Sicily, it’s on the slope of the volcano at 800m where the freshest vines are found. In Israel, most everyone agrees that the highest quality vineyards are those in Golan Heights which are naturally given the name, at high elevation. In Provence, I visited Chêne Bleu to find their elevation at over 500m brought about radical changes to what is seen at much lower elevations alongside the Rhône. And this isn’t lost on larger wineries as due to the encroachment of Global Warming, wine giants such as Torres are planting up high as well. But this comes back around to the photo of this article which is from Albert Costa, co-owner of Vall Llach. He recently started renting a very small, old Grenache & Hairy Grenache vineyard at the foot of the Montsant bluff. While this is still in DOQ Priorat, it’s a very, very different kind of Priorat as the soil is limestone up there. Sitting at 800m, this vineyard doesn’t produce much, only about 1,000kg of grapes a year. Maybe he’ll make a rosé or maybe something else with it. But, the character of this vineyard, like so many at higher elevations is different and it will allow him to try and make a different Priorat wine. Greece is also showing more and more promise with it’s “interesting” depth of wines (especially reds) from grapes grown at elevations of 500 meters and higher (even on their islands! ).